Dénes Farkas on the dark side of Alvar Aalto – Johannes Saar's Christmas card from Rovaniemi. In 1995, Tallinn Art Hall was reopened to the public after considerable refurbishment with the exhibition project "The Revival of the Space" by George Steinmann. It consisted of nothing but the very space itself, all stark white and finalised in its own right. After one month of public exposure, "regular" exhibition practice resumed and took the premises for granted, only occasionally referring to its locus as the utter limit and perimeter of the Estonian art world, or at least some of it. In 2012, Napa gallery in Rovaniemi ceased operating in its premises on Jorma Eton tie, part of the public library once designed by Alvar Aalto. The farewell show was by Dénes Farkas, who presented some quasi-images of the space itself, images reframing the space as the subject matter of the show. The diametrical symmetry with the previous event in Tallinn is topical, albeit misleading. It was after all the promise of a new future, an oath sworn for a better life – at least for artists if not for the public – that was provided in Tallinn back in the nineties. Now in Rovaniemi, Farkas' show "Kuvista sanoin" (Images to Words) dissolves the exhibition space so it becomes a hollow, questionable and ephemeral mirage, almost evaporating from the sight of the viewer, if there happens to be any eye-witnesses, of course. George Steinmann's project did not attract large audiences, although it returned to them the ultimate measure of perception – the space. Could it be that Dénes Farkas, converting familiar interiors into bleak and desolate atolls, will be welcomed with raving reviews? I would not bet on it. Luminous northern modernism turned out to be harsh to the bone long before he arrived, and depriving it of its affirmative content will not make him any new friends, I suppose. Although it adds to what the polar night does to subject matter anyway – sinking it into the shadows of doubt. Nicolas Bourriaud mentions "the recourse to already produced forms" in his discussion of the term postproduction. He also informs us that Dénes Farkas is not the first artist to reframe the heritage of Alvar Aalto. Jorge Pardo has cast Caribbean lights and rhythms on this some dozen years ago. He is one of those responding to an increase in the supply of artefacts by reinventing them in the new storylines: "When artists find material in objects that are already in circulation on the cultural market, the work of art takes on a script-like value: "when screenplays become form," in a sense", concludes Bourriaud. Yet in Rovaniemi, the Farkas' homage to space may fall into the context of closure, overwriting his works with a much more voluminous melancholy or despair than planned. Which leads me towards my own personal inducement to curate the Dénes Farkas show in Rovaniemi in the first place. I am not sure if it comes from the tragic history of Rovaniemi in the Second World War or Alvar Aalto's boldly modern urban plan that covered these traumas in the following years, but the sense of loss and nostalgia for modern welfare linger the same on the streets of Rovaniemi as in the oeuvre of Dénes Farkas, outdoing each other in turns. And I can barely distinguish one from the other – the city, tragically deprived both of its historical layers and modernist courage, has developed a mood so evident in Farkas work – melancholy of still-life, of nature morte, of nature being dead to take it literally from the French. Both city and artwork emanate the sorrow of a familiar landscape turned into someone else's dream, abandoned by earlier inhabitants and converted by ruthless rupture into some fading languid limbo. 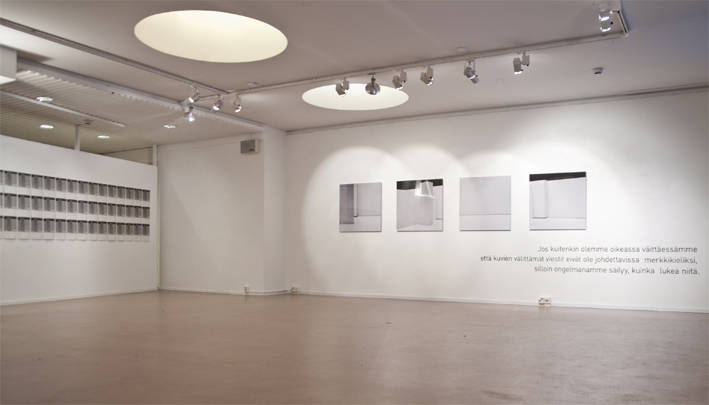 "Kuvista sanoin" refers to that transition by taking a well-known series of writings on photography and blowing it into fragments, into the subtitles of Farkas' own photography, supposedly filling the gap in meaning there, or more precisely – slaking the craving thirst for meaning with a written placebo. Dissecting this written corpus of photography into a kaleidoscope of free-floating sentences, however, always anchored to the very same image of the Napa Gallery interior, creates out of the latter the almighty signifier – a semiotic vortex able to absorb and radiate anything ever spelled out on photography in the Finnish language, to say the least. "Kuvista sanoin" was after all a magazine of international scale; hence, this memorial of words at Napa may stand for the larger arena of culture, once based on the common conviction that things can be said and understood, and matters communicated via language. Now, "on the flea market of culture" (Bourriaud), this communication era is lying second hand on sales desks waiting for another bricoleur trying to bend and forge heritage towards its own purposes. And here comes the long-awaited happiness – the central perspective converges at Napa Gallery, all the stories are told here and everything falls into place, taken over from someone else. Johannes Saar is the director of Centre for Contemporary Arts, Estonia.